The Sony NEX-5 now feature the same digital filters as the new Sony C3, with a firmware update, we find out how it performs. 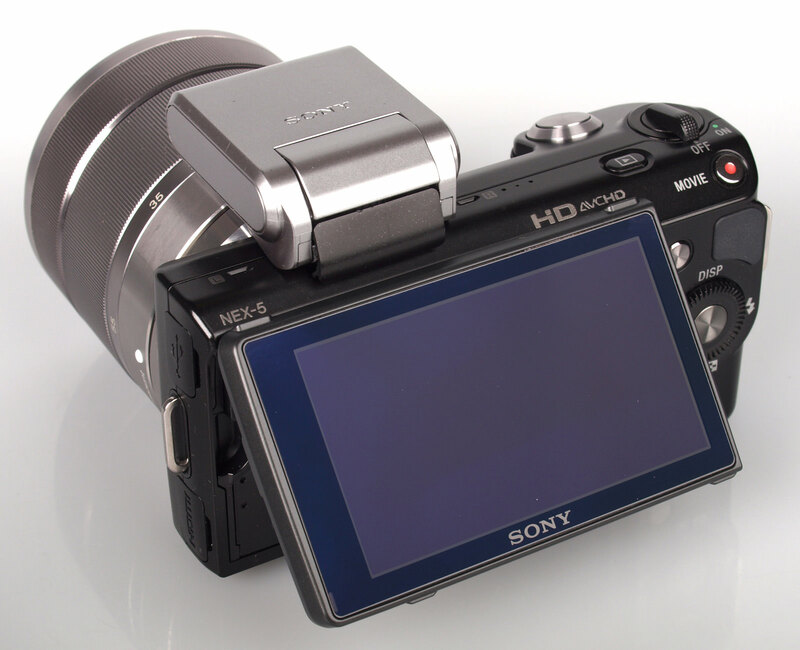 The Sony NEX-5 has recently been given a new lease of life, with an updated firmware that adds creative filters introduced with the NEX-C3. 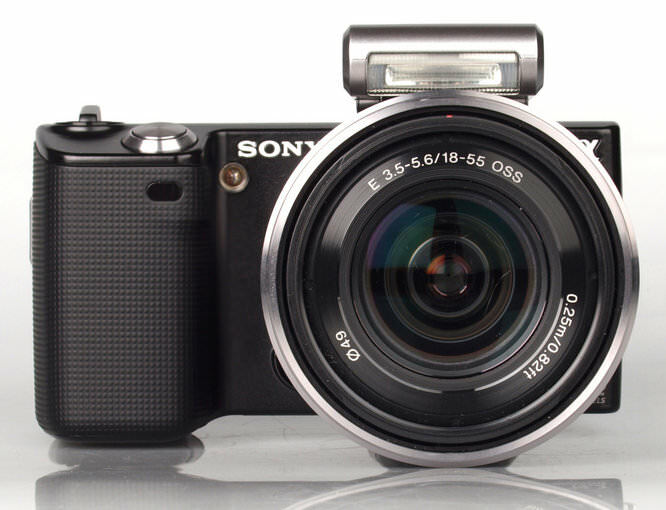 We review the Sony NEX-5 to see how it performs. 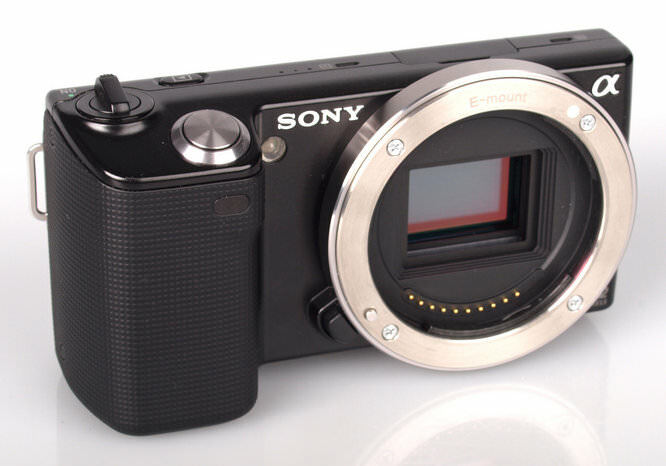 The Sony NEX-5 features a large APS-C CMOS sensor, the same size that you find in nearly all Digital SLRs (unless you go to full frame). This gives it the ability to offer theoretically the same excellent image quality as Digital SLRs, but at a significantly reduced size. New features introduced with the latest firmware, version: 04 (available here) are: Picture Effects such as Toy Camera, Red, Green, Blue, Yellow highlight, Pop Colour and more, as well as the the ability to set the Peaking level and colour in MF. 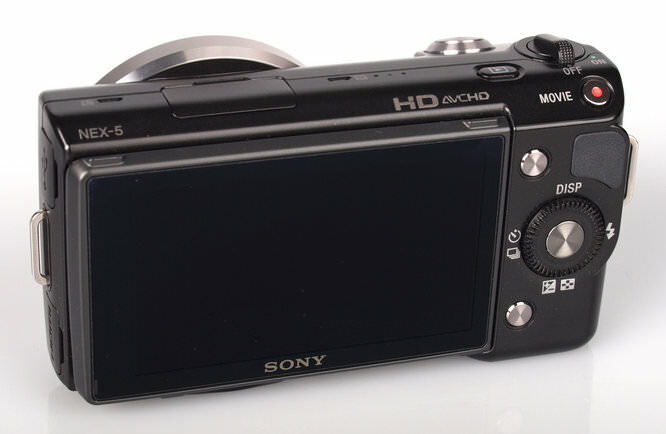 The Sony NEX-5 (3, and C3) are probably the mirrorless cameras with the least number of buttons and controls, especially considering they do not feature touch screens. Perhaps the Panasonic Lumix GF3 has fewer buttons (yes), but the GF3 tries to make up for this with a touch screen that works well. The size of the camera is tiny! However, as soon as you add a lens to the camera, you realise that the DSLR sized sensor, also means that the camera needs DSLR sized lenses, and this significantly increases the weight and bulk of the camera. There are a few options to keep the size down, either use the 16mm pancake lens, or use an adapter to use an alternative old lens. Menus: You can press the middle button on the back to change the shooting mode, and with the scroll wheel this is quite easy. Alternatively press the menu button and you get a choice of 6 options: shooting mode, camera options, image size, brightness / colour options, playback and setup. The brightness / colour options are where you can also find exposure compensation, ISO, white balance, metering, flash compensation, DRO / HDR, and creative style (colour options such as vivid, standard, black and white etc), which is not where I expected the options to be. Image size is where you set the image size for still, 3D, and panoramic shots, as well as video size. Camera options are where you can set the drive mode, flash setting, AF/MF, Face detection etc. Setup is where you can customise the buttons you use, as well as set further shooting options, main settings, and memory card tools. Finding your way around these menus may get easier over time. Battery Life: Rated at 330 shots, we were able to take 330 photos before the battery was exhausted. 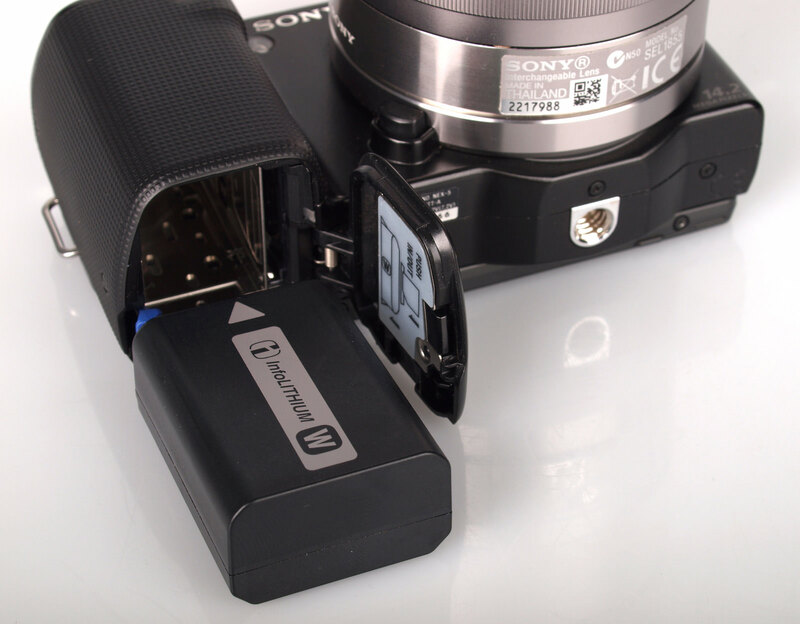 The camera uses an Info-lithium ion rechargeable battery these are brilliant as they tell you precisely how many minutes are left before the battery will go flat. 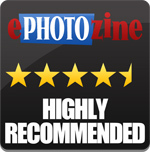 Speed - we tested the Sony NEX-5 and compared it to the Panasonic Lumix GF3 and Samsung NX11. You can also compare the results to the new Panasonic Lumix G3, and Olympus PEN E-P3 as well. Performance was good with quick focusing, shutter response, and excellent shot to shot time even with flash. Continuous shooting is excellent at 6-7fps, and the using a high speed card it's possible to take 18 shots before slow down. Sample photos from the Sony NEX-5 and the E 18-55mm f/3.5-5.6 OSS (Optical Steady Shot) lens can be seen below, with additional sample photos in the equipment database. The photos taken outdoors show good levels of detail and colour, with very little purple fringing, although some chromatic abberation is visible it wasn't too high. Images are slightly soft but nothing too concerning, although in shots detail was strongest in the centre, with the edges becoming softer. With the provided lens hood flare was well controlled and ghosting was not noticed. Barrel and pincushion distortion are also low, although slight pincushion distortion is visible at the telephoto end of the lens. The kit lens gives good macro performance with the subject 25cm away from the lens, using the full telephoto zoom. Great background blur (Bokeh) is possible with the lens. The camera also deals with highlights well, maintaining detail in the sky. The provided flash performs well with very low red-eye. White Balance Performance: The camera struggled under tungsten light but auto white balance was fine under fluorescent lighting, and the camera's presets have helped improve results, particularly under tungsten light. ISO Noise Performance: At ISO200 all the way to ISO1600 noise is very low. At ISO3200 noise starts to become visible, and images become slightly softer. ISO6400 shows more noise, but detail is still good and the results are very usable. Although at ISO12800 noise is the most prominant, and images may be best used resized on the web or processed further to reduce noise more. 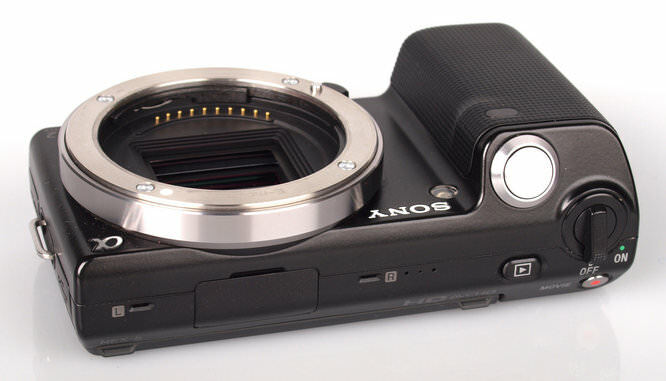 The NEX-5 allows both vertical and horizontal panoramics. Options are wide or standard, depending on how much you want to capture. Digital Filters - the new firmware, v04 introduces Picture Effect - this gives you 11 creative modes that let you alter your photos when you take them. The Red/Yellow/Blue/Green highlight modes seem to only work on quite specific shades of each colour (needing quite bold colours), meaning that there is very little green or blue in the example shots. The Canon and Nikon implementation where you can select the specific colour tends to work better. Lenses available: there are four lenses currently available (16mm, 18-55 OSS, 18-200 OSS, and a new 30mm Macro lens) with more on their way including a wide, portrait, and telephoto lens expected shotly. There are also wide-angle and fisheye converter add-on lenses available for the 16mm lens as well. Adapters to use Sony Alpha / Konica Minolta Alpha lenses are also available. The NEX-5 gives you Full HD video with stereo sound. The new picture effects can be used on videos with very little or no noticeable drop in frame rate. The video options are: AVCHD 1920x1080, MP4 1440x1080 or VGA. The Sony NEX-5 is available for £480 with the 18-55 kit lens with OIS, or £430 with the 16mm pancake lens (without OIS). Alternatively you can find the Sony NEX-C3 for £430 with 18-55 kit lens. Alternatives include the Olympus PEN E-P3, Panasonic Lumix G3, Panasonic Lumix GF3, Samsung NX11, as well as earlier models, the Panasonic Lumix GF2, and Olympus PEN EPL2. Of these, the Olympus PEN cameras feature a built in anti-shake sensor, and both the Panasonic and Olympus models use the micro four thirds mount, with the largest range of lenses available. The Sony NEX-5 seems to have an over-reliance on the menus, and it can be a little time consuming trying to find some of the more advanced options. As the smallest mirrorless camera, it is very appealing, although the current lenses don't make the most of the small body as they are quite large. There are also a limited number of lenses, although new lenses are expected shortly. The improvements added with firmware v03 gave the ability to customise the buttons to provide quicker access to your favourite modes, and v04 adds creative modes bringing the NEX-5 up to date with the new C3 and mirrorless cameras from other manufacturers. 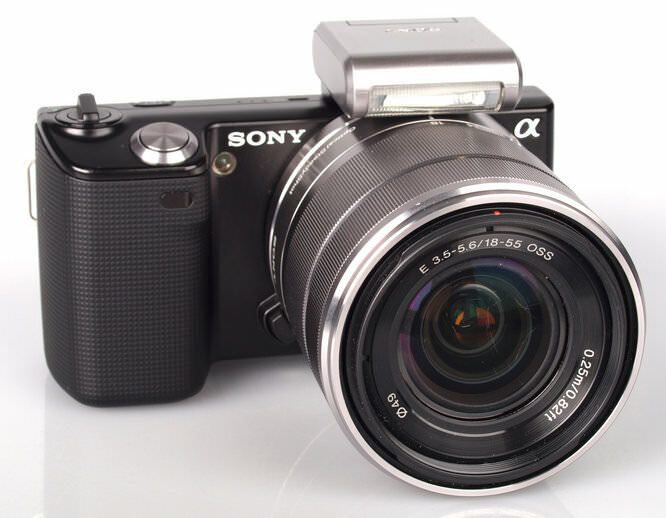 The Sony NEX-5 produces DSLR image quality with extremely low noise, and Full HD video, performance is impressive with 7fps shooting, and this really is a camera that might make you think twice about taking your DSLR with you. 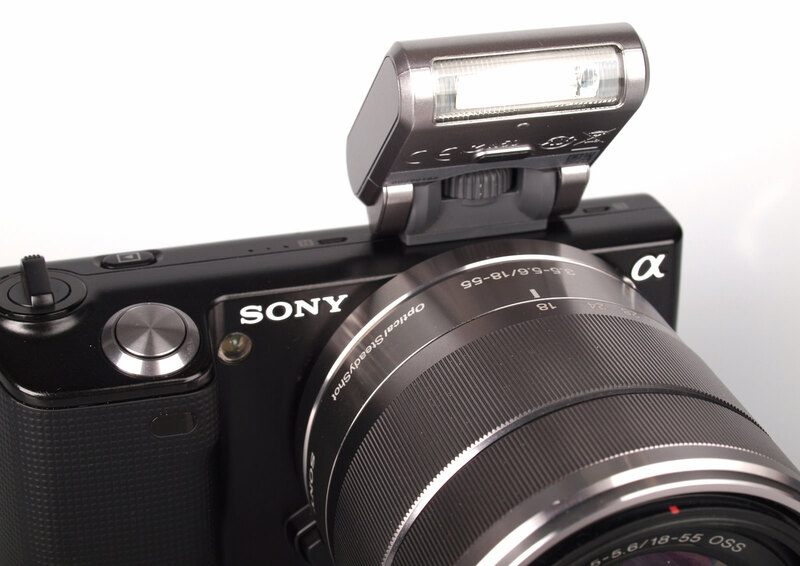 The Sony NEX-5 offers DSLR image quality in an ULTRA compact body. Good luck to anyone thinking of buying this... That flash is useless. The shadow from that lens is going to be awful and a lot of people are going to be very unhappy. That flash is useless. The shadow from that lens is going to be awful and a lot of people are going to be very unhappy. Not that I'm the least bit interested in buying one but the review says the following re the flash. "The provided flash performs well with very low red-eye." Not that I'm the least bit interested in buying one but the review says the following re the flash. "The provided flash performs well with very low red-eye." But then use your knowledge (indeed photographic intelligence) and ask yourself... what is the bottom half of an image - taken with that flash - [i]on that lens[/i] - going to show in the final image?? Answer - a black semi-circular 'nothing'! But then use your knowledge (indeed photographic intelligence) and ask yourself... what is the bottom half of an image - taken with that flash - on that lens - going to show in the final image?? Answer - a black semi-circular 'nothing'! It depends how close the subject is, and for macro or ebay shots for example you do run the risk of a black shadow and an overexposed subject. [quote]But then use your knowledge (indeed photographic intelligence) and ask yourself... what is the bottom half of an image - taken with that flash - on that lens - going to show in the final image?? Answer - a black semi-circular 'nothing'! [/quote] Well, I bought a NEX-5 yesterday and have just tried the flash at both 18mm and 55mm focal lengths. For shots around the room at home...ABSOLUTELY FINE!! Haven't tried close-ups or anything yet. Quote:But then use your knowledge (indeed photographic intelligence) and ask yourself... what is the bottom half of an image - taken with that flash - on that lens - going to show in the final image?? Well, I bought a NEX-5 yesterday and have just tried the flash at both 18mm and 55mm focal lengths. For shots around the room at home...ABSOLUTELY FINE!! Haven't tried close-ups or anything yet. What a lot of ill informed comment about the Nex's flash!! It works fine,even closeups,and I've taken a few since I got the camera! Just remember to take the lens hood off for closeups,otherwise,no problems at all. I leave the flash attached all the time,on Auto,and just pop it up when necessary,and it all fits in the case nicely. Bottom line it's a solid performer,producing great images,and is certainly great to carry about. As regards close-ups,use the 55mm end of the lens,as opposed to the wide angle end(like my Fuji Superzoom),and the results are really good.As the images are so good,enlargements are not a problem,so the 18-55mm is not as limiting as you might think. What a lot of ill informed comment about the Nex's flash!! It works fine,even closeups,and I've taken a few since I got the camera! Just remember to take the lens hood off for closeups,otherwise,no problems at all. I leave the flash attached all the time,on Auto,and just pop it up when necessary,and it all fits in the case nicely. Bottom line it's a solid performer,producing great images,and is certainly great to carry about. As regards close-ups,use the 55mm end of the lens,as opposed to the wide angle end(like my Fuji Superzoom),and the results are really good.As the images are so good,enlargements are not a problem,so the 18-55mm is not as limiting as you might think.